Let’s begin with what a hoverboard really is. Just what is a hoverboard? If the concept of a hoverboard is completely alien to you, think of it as personal transporters. Hoverboards are like little Segways sans the handlebars. Riders stand on the deck with each foot near a wheel on both ends. The idea is to balance. You move forward by tilting your body forward, sideways by shifting your weight on either side. With the ingenious sensors, hoverboards easily find balance. Lean forward a little more and you can go past 5, 10, or even 15 mph. To slow down or reverse, simply lean back. To turn, have one foot alternately press forward while the other foot, backward. 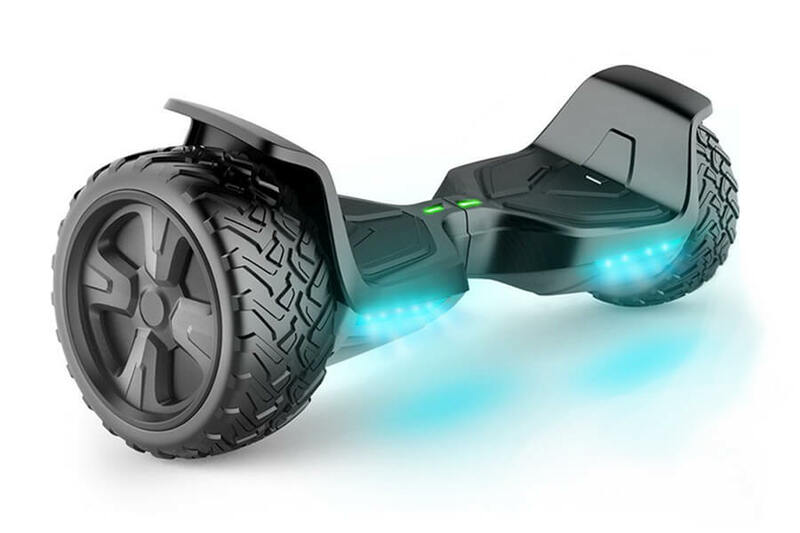 Hoverboards are powered by a rechargeable battery housed inside. Features vary from hoverboard to hoverboard. Some possess a smart key system, an app to prevent unauthorized use, and even speakers. If you’re a hoverboard greenhorn and are intimidated with the technical gobbledygook, fear not! Below is a cheat list of tips. Hoverboards don’t hover. Today’s technology won’t get you levitating like Marty McFly. Not yet, at least. What it can do, however, is glide. It’s hands-free. Your body weight does all the maneuvering. This isn’t for the young children. We highly recommend that hoverboards be operated by older kids who are at least 12 years old. It’s a body-balance-awareness thing. Older kids just have more of it. Reading customer reviews won’t hurt. Check out reviews on different sites for comments. In addition to knowing what they like best, it’s helpful to know what they like the least and what they feel the product could improve on. It takes a while for them to charge. Today’s hoverboards are amazingly strong and fast. They can get you anywhere from 10 to 15 miles on a single charge. They move quick too! 2 mph to 10 mph – nothing to sneeze at, really. Price ranges from $200 to $600. Check out features and specs before you shell out more than $600 (Tomoloo hoverboard prices are quite reasonable for its features.). It really better be worth it. There are great hoverboard models at lower prices below $600. Keep an eye on imitations. Several knockoffs have presented themselves as one of the major brands. Never buy hoverboards that don’t have a return policy. You can take all these into consideration OR you can simply look at Tomoloo Hoverboards. 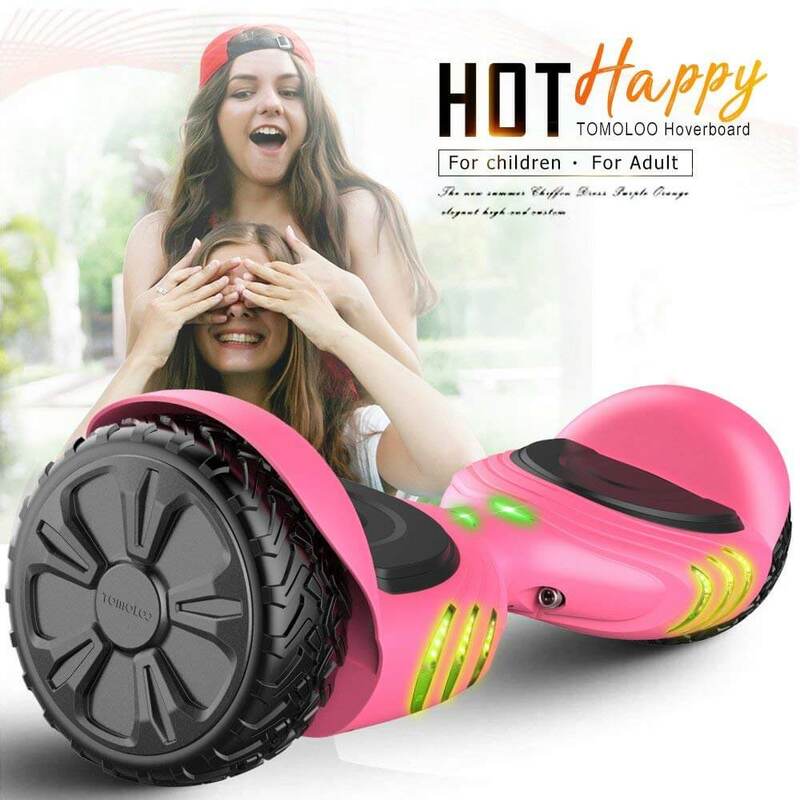 Established in 2013, the company behind Tomoloo hoverboards, Shenzhen Tomoloo Technology Industrial Co. Ltd., has since been producing quality hoverboards. The company is mum on who they have formed partnerships with, but we reckon that these are the world’s most influential. They have an astounding number of hoverboards: from the V1 POLEAXE, V@ Eagle, Q1 Sea Lion, K3, Q2X, and the V2. 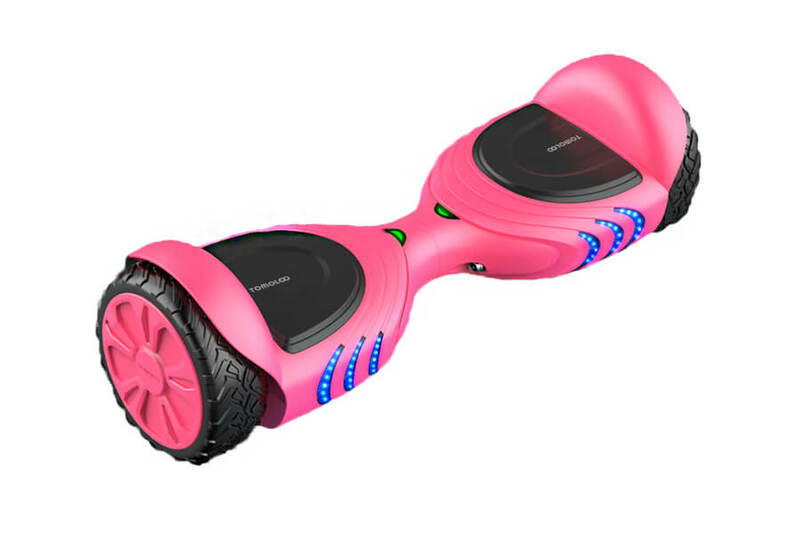 Each hoverboard comes in a wide range of colors and can be personalized or customized. All the hoverboards have been UL 2272 and UL 2271 certified. This means that each unit has passed hundreds of safety and electrical tests prior to being released to the market. These tests were created in response to a recall. A few years back, hoverboards were withdrawn due to explosions and fires. But with these certifications, the chances of that happening are nil. In addition to the UL certifications, Tomoloo proudly claims that they are also certified by CE, FCC, and RoHS. Their batteries are certified by UN38.3 and MSDS. The chargers are certified as well by GS, SOSA, CB, CE, RoHS, UL, and IEC series. But while the Tomoloo hoverboards have passed rigorous testing, these hoverboards must never be exposed to temperatures above 40 degrees Celsius / 104 degrees Fahrenheit. At temperatures this high, interior components can melt and render the unit useless. A UL 2272 means that the boards were brutally tested (almost fried). But keep in mind that safety still lies with the rider. The Tomoloo Hoverboard Blue Q1-C is UL 2272 certified. 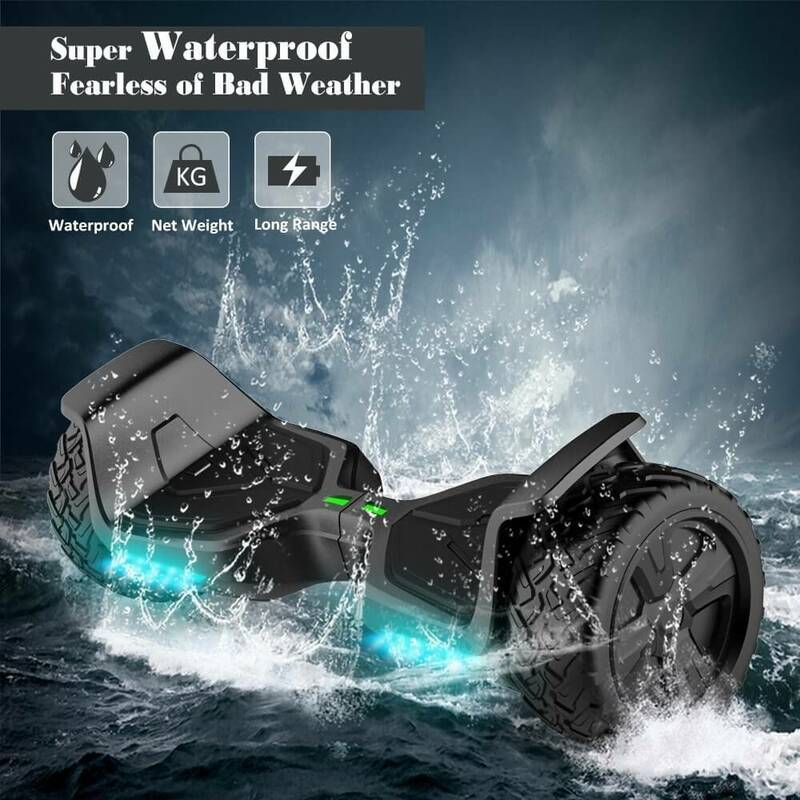 It is powered by a 3.5 brushless 200W (2 x 24V) explosion-proof battery. It can carry a maximum load of 220 lbs. On a single charge, mileage is at 7 miles with maximum speeds of up to 7 mph. With continuous use, the Tomoloo hoverboard Blue Q1-C has enough juice for 2 to 2-1/2 hours. Other features include a great mechanical self-balance system, anti-explosion tires, 360-degree rotation capabilities and protection against overcurrent, short circuit, overcharging, and over-discharging. The case is fire-resistant. As is standard for Tomolo Hoverboards, it comes with a waterproof cap and built-in lights on its deck. The Tomoloo Hoverboard K3 Galaxy Chariot is as intriguing as its name. Why Galaxy? And why the chariot reference? Well, the design is inspired by the Starship Troopers movie. It’s a reality meets sci-fi hoverboard. And clearly looks like it came from the future. The Tomoloo hoverboard K3 Galaxy Chariot is a new generation hoverboard. It is UL 2272 and UL 2271 certified and is made of premium materials. The avant-garde design puts it on a class of its own. What’s great about this model is the omnidirectional LED headlights with RGB LED design. It allows the rider to adjust the LED light color via the Tomoloo App. Not only does this provide you better visibility at night, it’s a great way to lend your personality to the hoverboard. Like its Tomoloo siblings, the Tomoloo hoverboard K3 features a waterproof cap for the power jack. This keeps it safe from water and moisture. With the app, riders can control the on/off switch, front and rear angles, steering sensitivity, speed, riding mode and music. The batteries on this model are Samsung. With the Smart Battery Management System, it is protected from overcurrent, overheating, short circuit, overcharging and excessive discharge. The battery shell is fire retardant as well. At 30 lbs, the Tomoloo hoverboard can get you to speeds of up to 10.6 mph, and distances of up to 12 miles. Charge time is just 2 hours while maximum load capacity is at a hefty 264 lbs. Tomoloo hoverboard Q2X-Pink Petite and powerful is a good combination. The Tomoloo Hoverboard Q2X-Pink comes from the Q line that features 6.5” wheels. Its complete model name is Q2X Fire Kylin. On a single charge, the Tomoloo hoverboard Q2X-Pink can go as fast as 7.45 mph. Its load capacity is 220 lbs and features a climbing ability of 15 degrees. If use is continuous, expect to get a good 3 to 4 hours of operation. Tires are at a petite but smooth riding 3.5”. Runs on 18650 lithium batteries 108 Wh / 4.3 Ah. 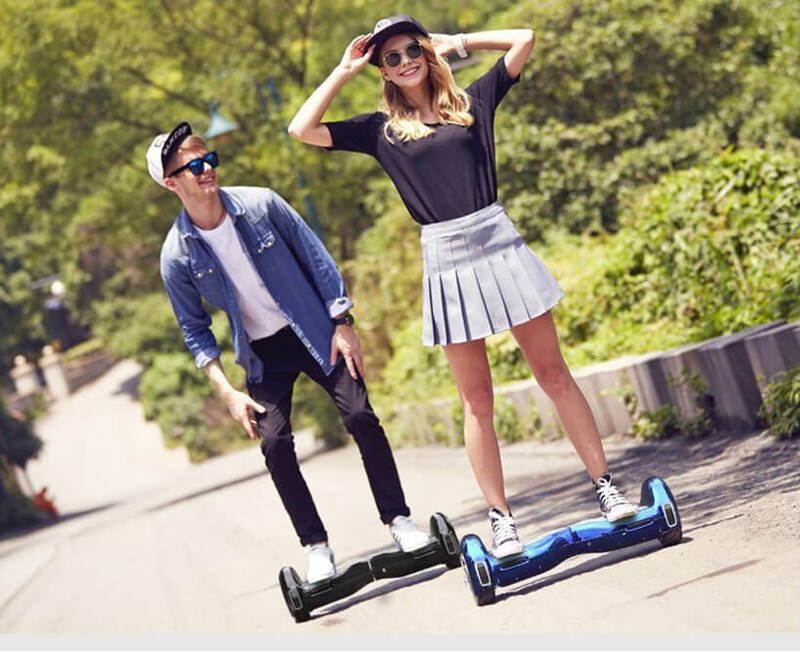 It shares the same features as other Tomoloo hoverboards – an app that allows riders to control the on/off switch, front and rear angles as well as steering sensitivity among many others. The Tomoloo hoverboard V2 Black is Tomoloo’s version of an off-road hoverboard. If you are looking to get down and dirty while pummeling through rough terrain, this is the model for you. Unlike traditional hoverboards, the Tomoloo Hoverboard V2 is equipped with large wheels – 8.5 inches. This provides great road grip. It is slightly bulkier than its siblings but it provides a more robust ride. This warrior is powered by two 350-watt electric motors. This gives it just the right advantage to conquer steep curves and inclines. Unlike its competitors, the Tomoloo V2 Black packs so much power for its size and weight. 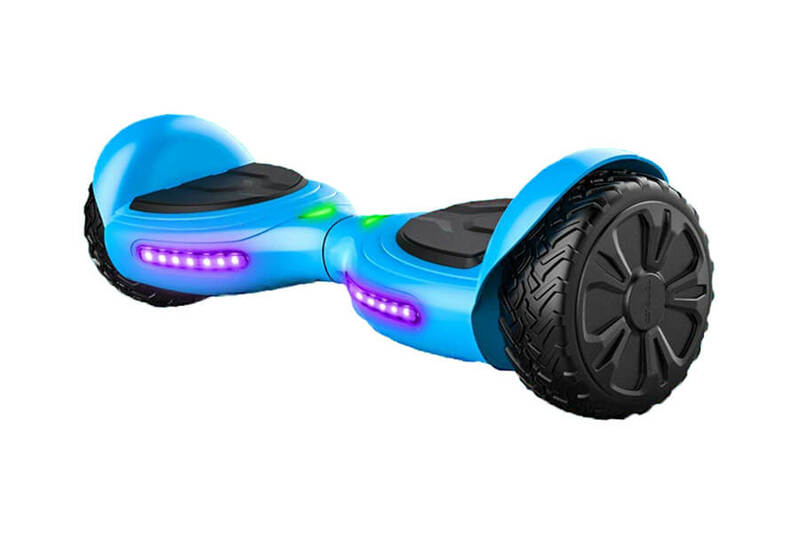 At a speed range of 12 mph, this model provides you with the fastest speed among similarly situated hoverboards. Few can deliver on its promise when it comes to the speeds above 10 mph. The app is also a given. But unlike other Tomoloo models, the Tomoloo Hoverboard V2 black has an app that supports up to 16 million different headlight colors. And the best part? It has a GPS that gives you in-depth details (travel time and current speed). 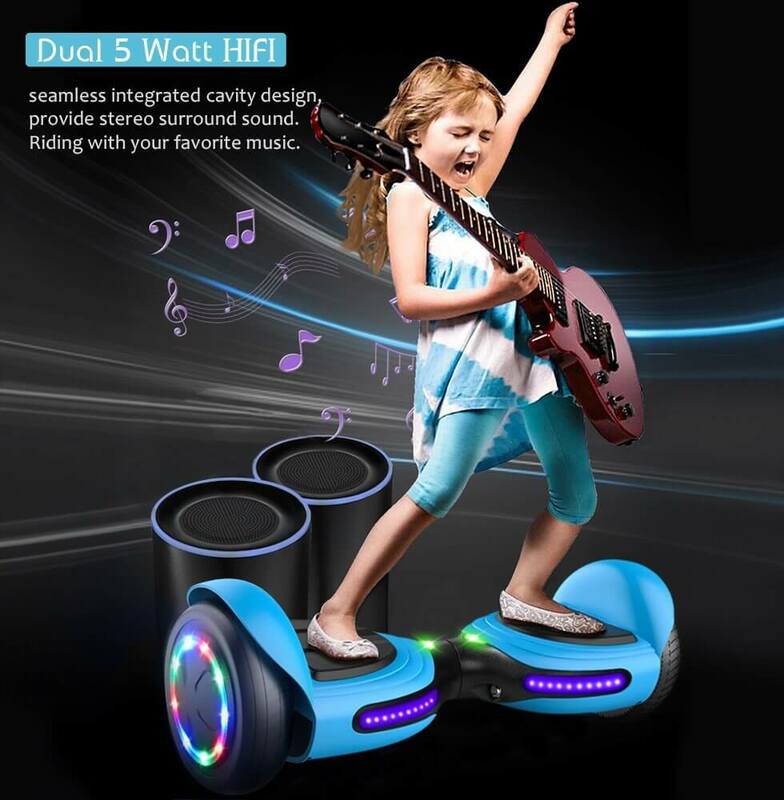 Just when you think that this hoverboard would compromise on other features because of the added, think again. The Tomoloo Hoverboard comes with a Bluetooth speaker – a 4.1 stereo surround sound audio. As expected of Tomoloo Hoverboards, this model can get riders as far as 12 miles on just a single charge. So what’s our take? Is the Tomoloo Hoverboard too good to be true? It’s the ideal hoverboard in our books. The designs are great, features are superb, and the price is at an acceptable range for its features. 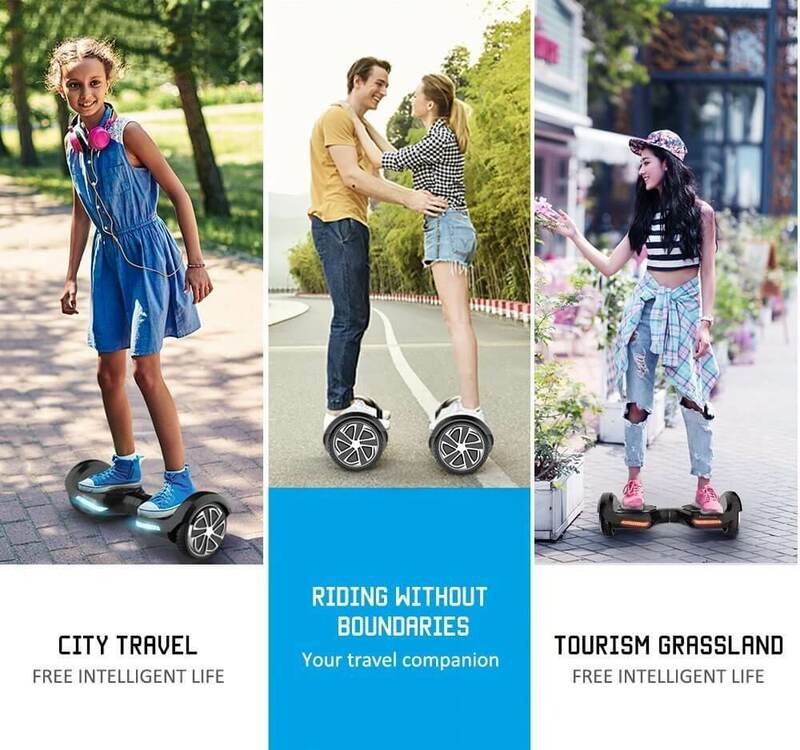 Tomoloo hoverboards will be a tough act to follow. Tomoloo hoverboards score great reviews on Amazon marketplace. A great choice for both kids and teenagers alike. 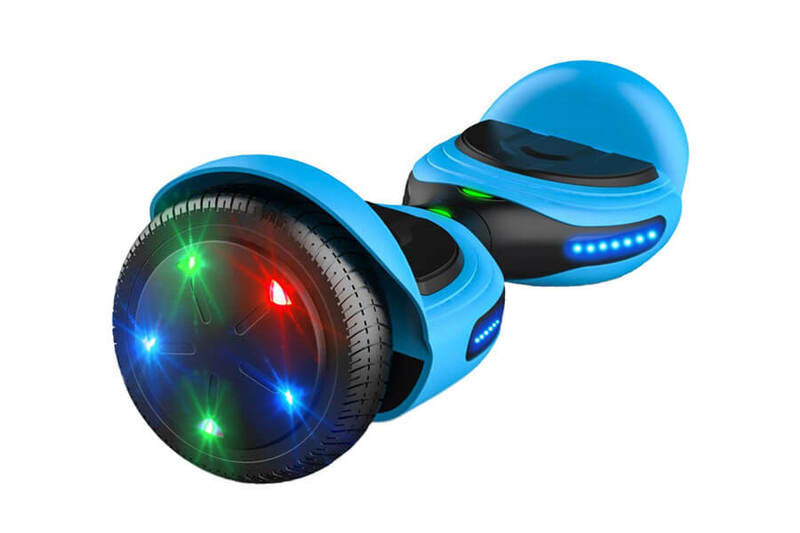 Very solid hoverboards with a UL certified batteries and a variety of cool features such as bluetooth speakers and LED lights. 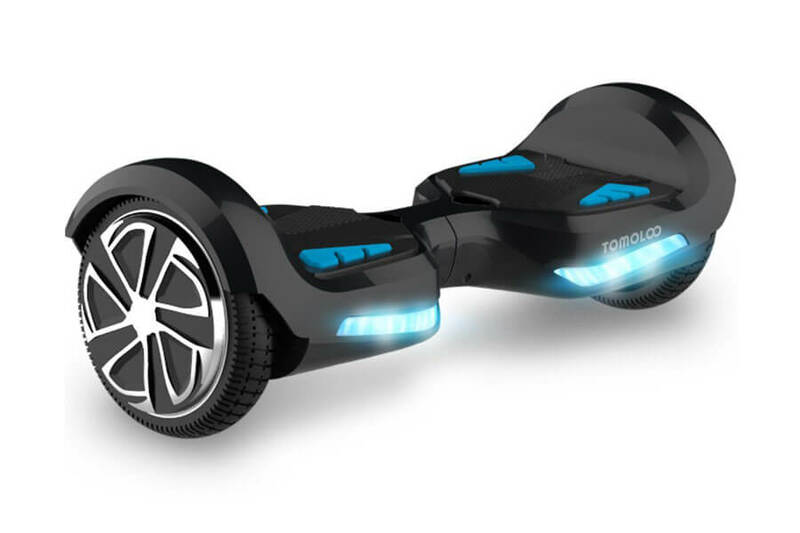 A Tomoloo hoverboard with off-road capabilities is also available.